Whether you’re looking for a way to revamp an extra bedroom, enclosed patio, den, loft, attic or garage, there are many ways to use your bonus room. These suggestions will help get you started so you can make the most of your space. A media room or home theater is one of the most popular ways to use your bonus room. This is an especially good use of space in a space where the sound is well-contained. A family room or a second living room is another of the most popular ways to use your bonus room, particularly for basements and outdoor living spaces. A well-stocked game room, complete with a game cupboard, game tables and possibly a pool table or ping pong, appeals to both family time and entertaining. 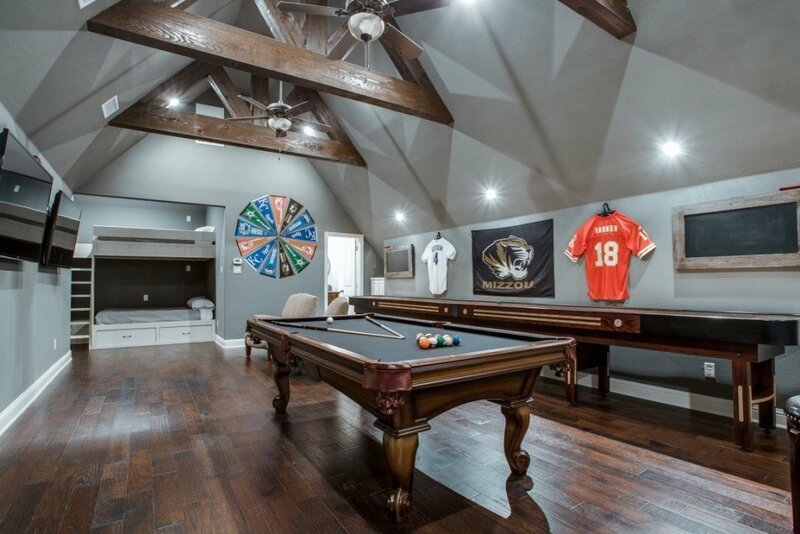 Take a look at the full photo gallery of the game room pictured above. Families with small kids will instantly recognize the benefit of having a dedicated kids’ room or play room, whether it’s in the basement, the attic, above the garage or in an empty bedroom. If you have budding musicians in the family, provide them a separate room where they can practice to their heart’s content. This will offer them privacy, and sanity for the rest of the family. Having a dedicated studio can offer huge advantages. One of the best benefits is that easels or photography backdrops don’t have to be torn down between sessions. A dedicated craft room can provide a space for you or your children to work, plus plenty of room for storing supplies and tools. If you’re into health and fitness, a home gym could be the perfect addition to your home. Fill it with your choice of equipment and create a space that’s both convenient and private. Practice your moves and perfect your routine in the comfort of your own home. With a wall of mirrors, good flooring, a stereo and a video player, you’ll create your own dancer’s paradise. Do you have your own business or frequently work from home? Create a dedicated space where you can work without distractions. A home office fits well in almost any space, whether you have an entire room or just an unused nook. Book lovers will appreciate the desire to have an entire room dedicated to books. Include a few comfortable reading chairs with side tables and good lighting for a classic home library. If you need a quiet space where the kids can do homework, create a separate space for them to focus. Set up a couple of desks, some bookcases, and good lighting to transform your bonus room. When you want to have a guy’s night, a man cave could give you space to entertain your friends without disturbing the rest of the house. Create a space to play poker, watch the big game, or just hang out. An unused room with a lot of windows could make the perfect sun room. Furnish it with chairs and tables to create a spot for reading, relaxing and enjoying the sunshine. One of the most popular ways to use you bonus room is to turn it into a luxury guest room. If you don’t entertain very often, furnish it with convertible furnishings to have a multi-purpose room. Are you looking for a way to use the extra space in your house? Get some ideas from our home remodeling project photos.